Aquaculture has the potential to both positively and negatively impact the surrounding communities. While there are apparent economic gains, especially in nations such as the Philippines, these gains are often short term in comparison to the lasting ecological damage. Fisheries can very negatively impact aquatic ecosystems, since often the fish are genetically altered or bred for certain characteristics that are not advantageous for survival in the wild. These fish, if they do escape can very negatively impact the ecosystems, placing a pressure on the natural environment. This negatively impacts other wild fish, which in turn negatively impacts local communities because the availability of wild fish is limited ("The Republic of the Philipines"). On a much larger scale, when there are commercial fisheries in impoverished areas, often the local people are unable to afford the fish that are produced. This is because many of the fish are carnivorous, and the food they eat is very expensive, so the price of the farmed fish is increased. Often the feed for these fish is caught in local areas, reducing locals access to fish through conventional fishing methods. The fish from the fisheries often are then exported to other areas, so they do not benefit the local communities in any form. When these fisheries are illegal, it is even worse for the local community, since they usually serve no economic benefit to the community. What makes this even worse is when the illegal ponds are abandoned, then the communities are left with the ecological damage from the fisheries, and the community had no economic gain. This ecological damage can be devastating to coastal communities, since often the damage is destroyed mangroves (which can shield the land from various natural disasters). Fisheries are also known to commit human rights violations, especially shrimp farms which are quite common in the Philippines. 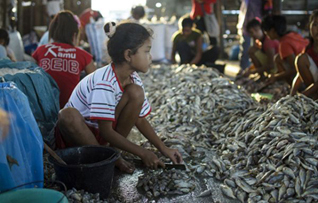 They often use child labor, and have been known to displace local people by taking their land through the usage of intimidation ("Aquaculture"). One example of this is when 1,000 homes were destroyed that were described as "urban poor family homes" for the creation of a fishery (Ratner, 2014). While not all fisheries commit these acts, it is important to recognize the threats that fisheries can pose to local people. If you would like to help preserve marine habitats and protect people in the Philippines you can volunteer ordonate to Enhance a Village.